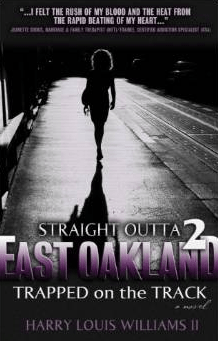 Straight Outta East Oakland 2: Trapped on the Track is an engaging urban fiction offering deep insight into the lives of sexually exploited minors and those those who abuse them. Crayon has been recruited by a brutal pimp named Phenomenal. She is 15 years old. Her grandmother knows only person who can save her. That individual is her late daughter Maggy s ex-boyfriend, Firstborn. Firstborn has been a year removed from his role as a crack dealer in the bloody streets of East Oakland. He lives a square life in a city where his past remains unknown. Ms. Holmes locates him and pleads with him to come back to Oakland to rescue Crayon. However, the task is easier said than done. Phenomenal is pushing a hard line in the streets. He is a head buster; a drug dealing gun runner with a hand in several illegal enterprises. Firstborn knows of only one person crazy enough to step to Phenomenal. However, he has sworn never to talk to his former best friend Drama again. Can he free Crayon from a living death on the track? Will Firstborn be forced to reunite with the Black Christmas Mob? Will he be dragged down into the depths of hood life never to emerge again?